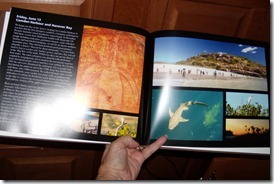 Picasa Tip: Holiday Gifts with Photos – Learn Picasa and Google Photos! 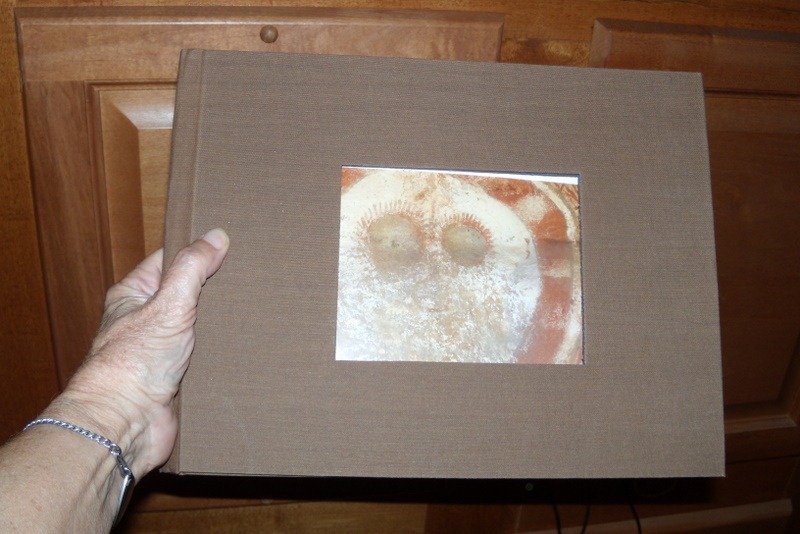 Want to solve all your holiday giving needs with just a few clicks in Picasa! 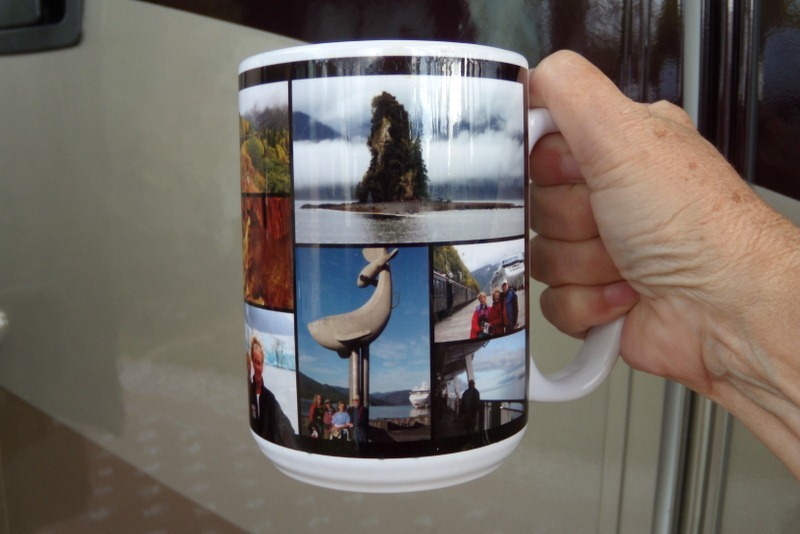 Collage coffee mugs were my gifts to family last year because we went on a family cruise to Alaska and I put our pictures on the mugs. You can also order cards with your photo on them, or calendars, or puzzles, or t-shirts, or … well, I think you have the idea! Gather the desired pictures. The most time consuming part will probably be deciding what picture or pictures you want to use. When you have them all in the selection tray (Tutorial Video: Selecting), click the ‘Shop’ button in the bottom toolbar – or File->Order Prints. This will bring up a list of possible providers from which to choose. I’ll use Walmart for this example, but there are lots to choose from – you may want to do a little research on providers of the kinds of gift you want to create. Once you choose your provider, you need to create an account with them. This process is going to upload your selected pictures to the provider’s servers so they need to be identified as belonging to your account. 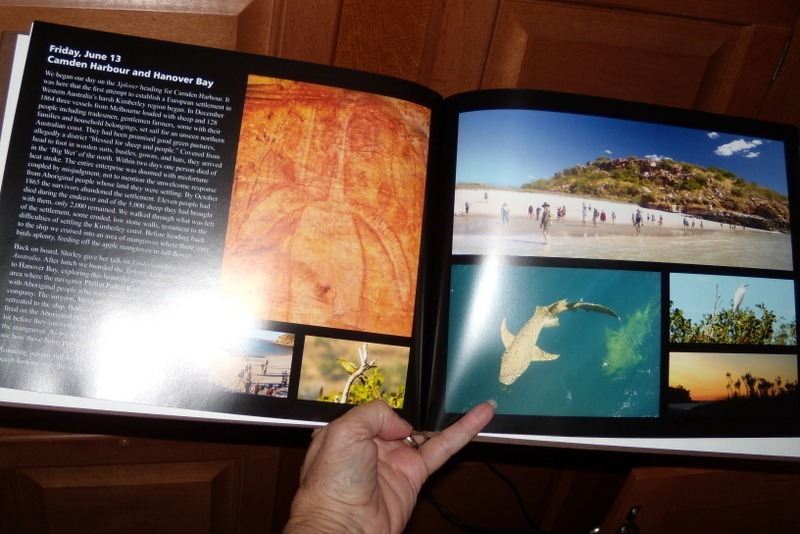 Notice there is a place to give this group of pictures an ‘album’ name – I’ve used ‘Travels’ for this example. You should also realize that this will upload your pictures at their highest resolution (size) so that the prints come out as good as possible. That means this process will take a little time, so, don’t use any more pictures than you need. Not only are there 20 different choices of mugs, cups, and waterbottles as I scroll down the screen. On the left side I see Blankets, Books, Calendars, Cards, Clothing & Jewelry, Mousepads, and more. 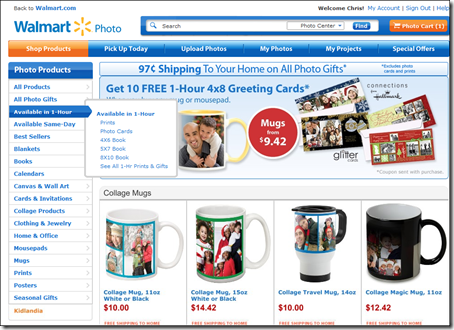 The Walmart site gives you the option of having words – a title – on the mug. 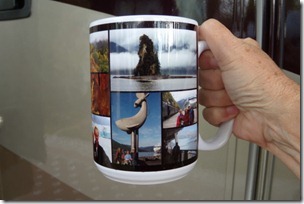 Then, you’re asked to select the pictures you want on the mug. Since I’ve used my Walmart account several times, I have several other uploaded albums to choose from. All the Album names appear on the left sidebar, so click on Travels, and then click on all 7 pictures and then ‘Continue.’ Next it displays the collage of how the pictures will fit on the mug. I have the option to shuffle the photos until they’re arranged to my liking and also to type the title I want. This is all web-based so it is a little slow. Just be patient. Once you have your mug designed, you can select a quantity, and ‘Add to Cart. Read the next screens carefully as they want you to buy more stuff! Lastly, you’ll enter a shipping address or a Walmart store near you where you can pick it up – or near your recipient, and they can pick it up! You might want to check out some of the other providers by visiting their websites before making your choice in Picasa. 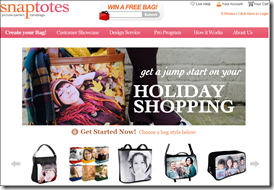 For example, Snaptotes will put your pictures on purses and tote bags. 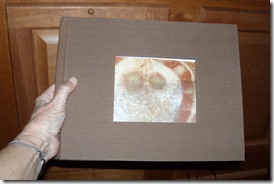 Fotoflot mounts your pictures in a way that makes them look like they’re floating on your wall – very high class. And, how about making that certain someone feel *really* important by putting their photo on a stamp? 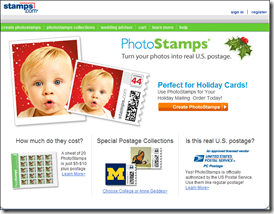 At PhotoStamps you create real U.S. postage stamps with your pictures.